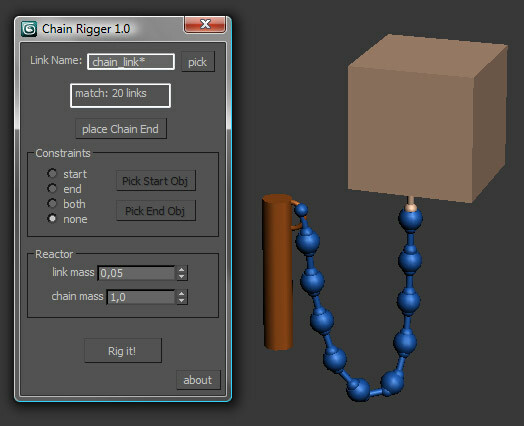 I just released a new tool for 3ds max, called Chain Rigger. This MaxScript tool creates a simulation rig for a chain (free or constrained) with a few simple steps. The rig is an optimized one, very stable and fast to simulate, based on a Reactor rope. I uploaded a video that shows how to use the tool. To download the script (including an information text file, a tutorial and an example scene), visit the scripts section of my website. Like Autumn Leaves, this tool is also based on a technique I used for some FX in Planet 51. Namely, rigging and simulating the alien-dog's chain. As with all my other scripts/tools, feel free to use this for any purpose. I only require proper credit and that, if you feel like it, drop me an email to tell me how useful it was. All comments, bug reports and ideas for improvement are most welcome.